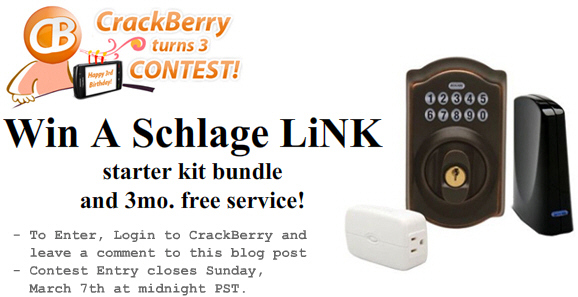 CrackBerry Turns 3 Birthday Contest: Win a Schlage LiNK Starter Kit and 3 Months Free Service! Man I love Birthday Week at CrackBerry.com. The contests just keep coming and the site is a buzz'n. It almost makes getting older feel like a good thing. Our next item up for grabs is provided by our friends at Schlage who are going to set one lucky winner up with a Schlage LiNK Starter Bundle (your choice of deadbolt or lever, as well as a Schlage Wired Camera and Trane Remote Energy Management Thermostat) and three months of free service. In case you missed our Schlage LiNK Review, the Coles Notes on it is that it allows you to lock/unlock the door to your home right from your BlackBerry as well as control your themostat and take care of security! Definitely awesome. For your chance to win, just leave a single comment to this blog post. And to learn more about the Schlage LiNK Home Automation System, jump on over to link.schlage.com. Good luck!